This past Wednesday, I had the privilege of spending the day in Annapolis to listen in as various elected officials talked about the budget, bills and legislation currently in play, and what that could mean for those in leadership and business in Maryland. I felt encouraged by much of what I heard; budgets being balanced, pensions being funded, actions being taken to make doing business in Maryland more profitable and attractive for employers to name a few items. Education was something discussed at length by each official who addressed our group, and rightly so. One speaker in particular was heavily focused on how many students in Maryland graduate with a four-year-degree. I don’t remember the number, but it was apparently quite impressive. I listened as he went on about the importance of all kids having access to higher education. When it was finally time for a few questions my hand shot up like an arrow. I asked the official (who shall remain nameless) how he planned on addressing the lack of tradespeople and what the plan was to encourage students to pursue careers in the trades. His answer floored me. I was almost speechless, which if you know me, is quite a feat. Although I don’t remember it verbatim, it went something like this. Well, we have a lot of inmates. That sounds like something the inmates could be doing. The fact that this elected official’s immediate response to a career in the trades was INMATES tells me that we have a lot of work to do. If you follow us on social media, you know I am kind of a Mike Rowe fan girl. 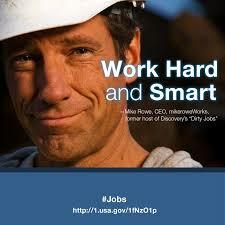 Mike Rowe Mondays are a thing. At the risk of over-saturating you with Mike Rowe content, we must continue to spread his message, which I will let him summarize for you in case you live under a rock with no access to HBAWC’s Facebook page. “I think a trillion dollars of student loans and a massive skills gap are precisely what happens to a society that actively promotes one form of education as the best course for the most people. I think the stigmas and stereotypes that keep so many people from pursuing a truly useful skill, begin with the mistaken belief that a four-year degree is somehow superior to all other forms of learning,” Rowe says. While I get the old adage of working smarter not harder, since when did hard work become something to disdain? Something for the uneducated, even the incarcerated? While it seems that Rowe’s message is spreading and gaining some traction, it is going to take all of us to turn the tide of public opinion. Our kids must know that if they want to pursue a skilled trade instead of going to college, that is an honorable choice worthy of all the support and celebration that would come with acceptance into the university of their choice. I am not trying to hate on the incarcerated, but the fact that they were the population who sprung to mind when skilled trades were mentioned is troublesome evidence that we have a perception problem that needs tending to. So, what CAN we do? As with anything worth doing, it will take time and effort. The solution might start with something as simple as reaching one and teaching one. Next month at HBAWC’s General Membership Meeting our speaker will be sharing about an exciting new Apprenticeship Program in Washington County. There are kids who want to work, and they need someone to invest time in them to patiently show them how to do the job right. Time, perhaps you are thinking, you probably don’t have. Someone needs to find the time. As a skilled trades person, your knowledge and encouragement is exactly what the potential tradespeople of tomorrow need . We need to demonstrate to them that you can work smarter and harder, and by doing so you can build a wonderful, fulfilling life. We need to let them see that a future in the trades isn’t reserved for the unambitious or incarcerated, but for the best and brightest young men and women. Let’s do it. I agree with a lot of what’s been said in this blog. Our kids have a choice of going to college or pursuing a skilled trade. Whatever they choose, we need to be all for it. Both choices are equally great choices. If my daughter wants to become an electrician, I’ll SUPPORT her! I will make sure she understands this.